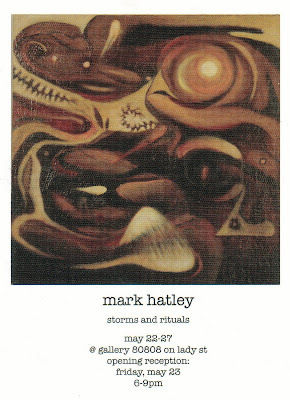 Gallery 80808 is proud to announce the opening of recent oil paintings by Mark Hatley in an exhibition called “Storms and Rituals”. The work is abstractions on canvas, panel, and copper surfaces that are based on personal experiences in nature. Hatley describes his images as “high concentrations and manifestations of energy”. Hatley graduated in 2006 with a BA in Studio Art from East Central University in Oklahoma and has continued his artistic studies in South Carolina. For more information and additional viewing opportunities, please contact Mark Hatley at (803) 917-8732.